Calls by energy firm Cuadrilla to alter fracking tremor limits appear to have fallen on deaf ears. The company has called for fracking earth tremor limits to be reviewed to aid the operation at its Preston New Road site. No fracking has taken place at the site since December, with fracking prior to Christmas 2018 triggering 57 small tremors – several above the 0.5 magnitude (ML) safety limit at which the operation has to be paused for 18 hours. Yesterday Cuadrilla announced it had asked the Government agency responsible to review the 0.5ML limit to allow fracking to continue at the site. A company spokesman said: “Cuadrilla confirmed that it has requested the Oil and Gas Authority to urgently review the TLS [traffic light system] to enable the Preston New Road exploration wells to be properly tested and produced effectively, without compromising safety or environmental protection. But a spokesman for the oil and gas industry regulator the OGA said it would not be reviewing the system used to monitor fracking. Earlier this week Cheshire energy firm Ineos urged the Government to raise “absurd” limits on fracking which it said were making the UK’s shale gas industry “unworkable”. A spokesman from Frack Free Lancashire said they are “amazed that Cuadrilla are still lobbying to adjust the seismic levels”. 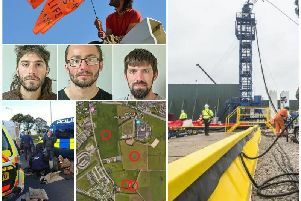 They added: “The existing seismic limit of 0.5ML was arrived at after a scientific inquiry and Cuadrilla themselves claim to have developed the traffic light system in conjunction with the Government. Jamie Peters, a Friends of the Earth anti-fracking campaigner, said: “The amount of gas under our feet in Lancashire is irrelevant when we know that they cannot extract it without triggering earthquakes. “It’s pretty insidious for the industry to suggest that if we want the shale gas ‘prize’, we have to accept weaker regulations. Ken Cronin, chief executive of UK Onshore Oil and Gas (UKOOG), highlighted the country’s demand for gas as a reason to continue with fracking in Lancashire. Fylde MP Mark Menzies said: “I have campaigned for a large number of safeguards to be put in place in respect of hydraulic fracturing, including the traffic light warning system and baseline and ongoing monitoring for Radon. Those traffic light limits were put in place and accepted by assessors and industry. They should not be increased. 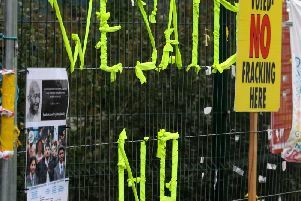 John Sauven, executive director of Greenpeace UK, said: “Cuadrilla have practically admitted that they can’t make fracking work under the safety rules they’ve been boasting about for years. “If they can’t, then they shouldn’t. In order to ‘grasp the prize’ of a very small amount of very expensive fracked gas, ministers have already removed people’s property rights and are pushing plans to suppress all local democratic control by allowing fracking without planning permission. “And now the industry need just one more regulation to be lifted, the safety limit on earthquakes. Lee Petts, chairman of Lancashire For Shale, said the traffic light system thresholds do now need to be looked at again if Lancashire shale is to fulfill its true potential. Mr Petts said: “When the Traffic Light System was first introduced, the Government was clear: the thresholds it contains were ‘subject to review’ and that ‘the [0.5 ML] level may be adjusted upward if actual experience shows this can be done without compromising the effectiveness of the controls’. “Cuadrilla now has this experience and the data to back it up, and is quite rightly asking the Government to honour its pledge by conducting a review using the up-to-date information that it has invested many millions of pounds acquiring. “By insisting that the 0.5 ML limit remain in place, campaigners are seeking to move the goal posts by unfairly pressuring the Government to reverse its stated position. When it was originally seeking permission for fracking in Lancashire, Cuadrilla welcomed monitoring of the site. In January 2018, Cuadrilla welcomed reports from two scientists that suggest increasing the tremor limit at drill sites could be done safely. Mr Egan said: “Cuadrilla and its investors remain committed to this opportunity. April/May 2011: Fracking was blamed for two earth tremors felt across Blackpool and the Fylde. One tremor of magnitude 2.3 hit on April 1, followed by a second of magnitude 1.4 on May 27. A moratorium was placed on fracking. December 2012: The moratorium on fracking was lifted in when the Government decided that it could go ahead – with strict controls and monitoring. June 2015: Lancashire County Council finally ruled on the two planning applications. They were refused on grounds of noise and visual impact at Preston New Road and on traffic impact grounds at Roseacre. October 2016: Communities Secretary Sajid Javid approved plans for fracking at Cuadrilla’s Preston New Road site at Little Plumpton. February 2019: Cuadrilla calls on the Government to review the 0.5 magnitude tremor limit which stops fracking.